Handmade by Tails Me About It. Our Hibernating Hound Sacks are made from a heavyweight sherpa and premium fleece. Your pet, cat,dog, etc will love this snuggly sack. It is made from super soft materials that are super warm and cozy. Once they go in, they will not want to get out. This pet bed is perfect for pets that love to burrow under the blankets. 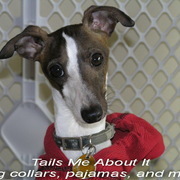 Greyhounds, Whippets, Italian Greyhounds, Chinese crested, Chihuahua's, Yorkie's, Dachshund's, etc. Our Hibernating Hound Sacks can be used pretty much anywhere because it is easy to fold and carry and fit in places some pet beds can't. Use it in crates, camping, in the car, etc. All of our Hibernating Hound Sacks are sewn together with a Serger to ensure seams will last. They also have NO exposed seams. Other sizes available: Sack measurements run width by length. Use the measure guide listed and measure your pet from nose to base of tail. Add 8" to that measurement and choose from our available sizes that best fits your pet. 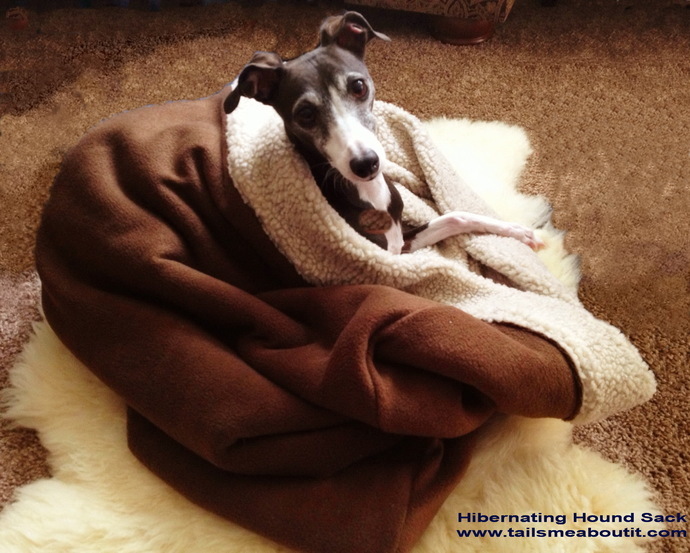 How to clean: Our Hibernating Hound Sack can be machine washed and dried. I do recommend that you wash in cold water with like colors and dry in low heat or hang to dry. This will help keep your Sack in great condition for many years.